A total of seven Earth-like, potentially habitable worlds have been discovered orbiting a nearby star known as TRAPPIST-1. Just 40 light-years away, the star’s diminutive size and dim light output mean it is known as an ultracool dwarf. ESOcast 96 explores this important discovery, from how the astronomers made the incredibly intricate measurements required to find and study the planets — including observations with ESO’s Very Large Telescope — to each world’s potential to support life as we know it. Excitingly, three of the planets in the system orbit in the habitable zone around TRAPPIST-1, and could harbour oceans of water on their surfaces. Dwarf stars like TRAPPIST-1 are very common in our galaxy, making rich planetary systems like this some of the best targets in humanity’s search for life elsewhere in the Universe. This ESOcast takes you on a journey through one such system, which contains both the largest number of Earth-sized planets and the largest number of potentially habitable worlds ever discovered. This infographic displays some artist's illustrations of how the seven planets orbiting TRAPPIST-1 might appear — including the possible presence of water oceans — alongside some images of the rocky planets in our Solar System. 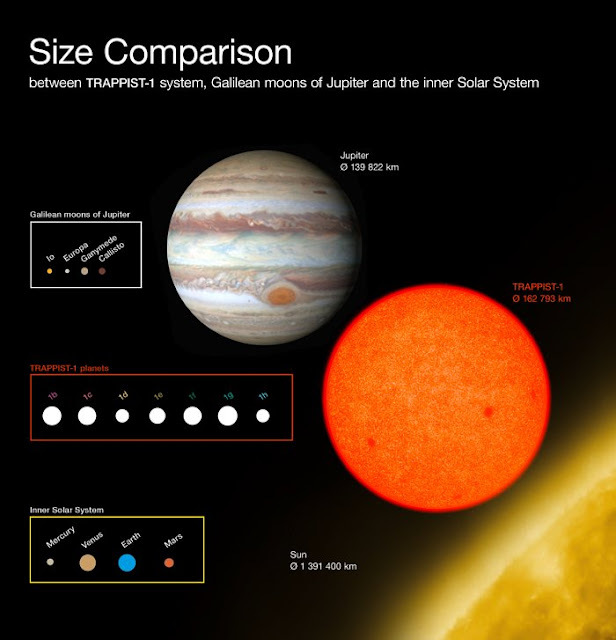 Information about the size and orbital periods of all the planets is also provided for comparison; the TRAPPIST-1 planets are all approximately Earth-sized. Astronomers have found a system of seven Earth-sized planets just 40 light-years away. Using ground and space telescopes, including ESO’s Very Large Telescope, the planets were all detected as they passed in front of their parent star, the ultracool dwarf star known as TRAPPIST-1. According to the paper appearing today in the journal Nature, three of the planets lie in the habitable zone and could harbour oceans of water on their surfaces, increasing the possibility that the star system could play host to life. This system has both the largest number of Earth-sized planets yet found and the largest number of worlds that could support liquid water on their surfaces. Astronomers using the TRAPPIST–South telescope at ESO’s La Silla Observatory, the Very Large Telescope (VLT) at Paranal and the NASA Spitzer Space Telescope, as well as other telescopes around the world , have now confirmed the existence of at least seven small planets orbiting the cool red dwarf star TRAPPIST-1 . All the planets, labelled TRAPPIST-1b, c, d, e, f, g and h in order of increasing distance from their parent star, have sizes similar to Earth . Dips in the star’s light output caused by each of the seven planets passing in front of it — events known as transits — allowed the astronomers to infer information about their sizes, compositions and orbits . They found that at least the inner six planets are comparable in both size and temperature to the Earth. With just 8% the mass of the Sun, TRAPPIST-1 is very small in stellar terms — only marginally bigger than the planet Jupiter — and though nearby in the constellation Aquarius (The Water Carrier), it appears very dim. Astronomers expected that such dwarf stars might host many Earth-sized planets in tight orbits, making them promising targets in the hunt for extraterrestrial life, but TRAPPIST-1 is the first such system to be found. 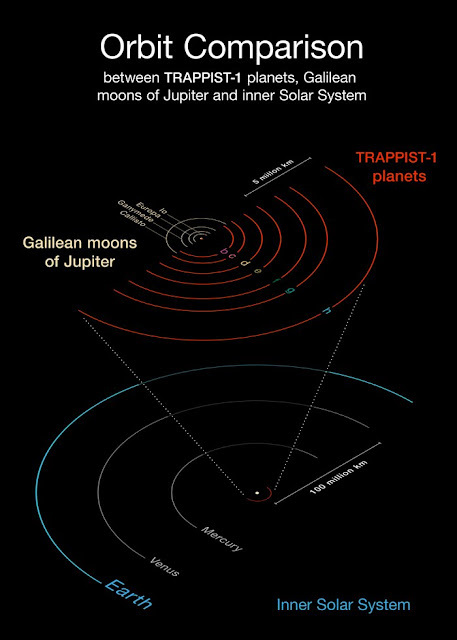 This diagram compares the orbits of the newly-discovered planets around the faint red star TRAPPIST-1 with the Galilean moons of Jupiter and the inner Solar System. All the planets found around TRAPPIST-1 orbit much closer to their star than Mercury is to the Sun, but as their star is far fainter, they are exposed to similar levels of irradiation as Venus, Earth and Mars in the Solar System. The team determined that all the planets in the system are similar in size to Earth and Venus in the Solar System, or slightly smaller. The density measurements suggest that at least the innermost six are probably rocky in composition. The planetary orbits are not much larger than that of Jupiter’s Galilean moon system, and much smaller than the orbit of Mercury in the Solar System. 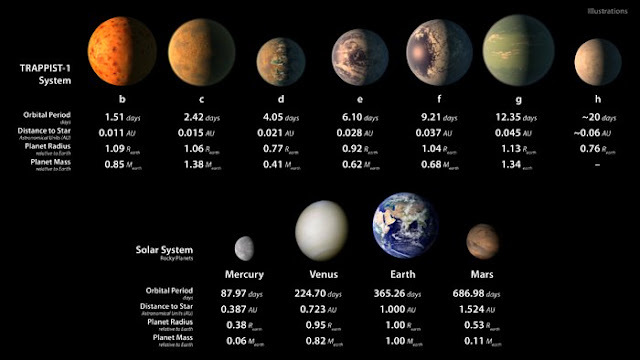 However, TRAPPIST-1’s small size and low temperature mean that the energy input to its planets is similar to that received by the inner planets in our Solar System; TRAPPIST-1c, d and f receive similar amounts of energy to Venus, Earth and Mars, respectively. This diagram compares the sizes of the newly-discovered planets around the faint red star TRAPPIST-1 with the Galilean moons of Jupiter and the inner Solar System. All the planets found around TRAPPIST-1 are of similar size to the Earth. All seven planets discovered in the system could potentially have liquid water on their surfaces, though their orbital distances make some of them more likely candidates than others. Climate models suggest the innermost planets, TRAPPIST-1b, c and d, are probably too hot to support liquid water, except maybe on a small fraction of their surfaces. The orbital distance of the system’s outermost planet, TRAPPIST-1h, is unconfirmed, though it is likely to be too distant and cold to harbour liquid water — assuming no alternative heating processes are occurring . TRAPPIST-1e, f, and g, however, represent the holy grail for planet-hunting astronomers, as they orbit in the star’s habitable zone and could host oceans of surface water . To take a brief tour of the more prominent contenders, it helps to zero in on the “habitable zone” around their stars Dissertation Service Company @ Dissertation Bliss This is the band of congenial temperatures for planetary orbits.